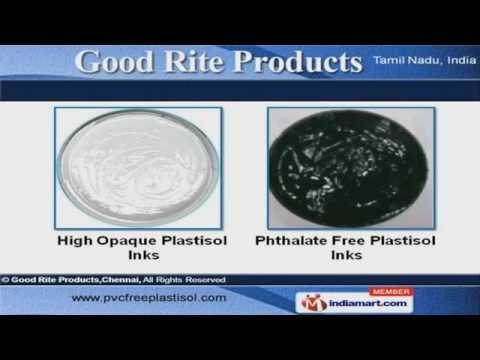 Welcome to Good Rite Products Manufacturer & Exporter of Powder Coatings & Plastisol Inks. The company was incepted in 2000, at Chennai. Our Robust manufacturing unit, Ethical business practices & Wide distribution network make us unique in the industry. Rigorous quality checks, Prompt delivery & Superior quality are some of the striking features of our organization. We offer a splendid range of Water Based Textile, Clear & Non PVC Plastisol Inks. Specialty, PVC & Non PVC Oil Based Plastisol offered by us are a class apart. High Opaque & Phthalate Free Plastisol Inks are valued for durability and resistant to colorfastness. We offer best quality of PVC Plastisol that can be availed at optimum range. PVC Free Plastisol Colours, Powder, TGIC and Non TGIC Powder Coatings are best in terms ofquality. We also provide Epoxy, Hybrid Powder Coatings & Plastisol Fluorescent Series that we well known for their properties.